Your nursery or education environment should be a place of HYGGE. At The Curiosity Approach, we first introduced the word Hygge, in our latest book The A-Z of The Curiosity Approach 2017, but what does it mean and why should we pay attention to the physical environment we provide for children? Hygge (pronounced hue-guh not hoo-gah) is a Danish word used when acknowledging a feeling or moment, ordinary or extraordinary as cosy, charming or special. Hygge is a feeling you cannot translate. It’s about a space that promotes emotional well-being, togetherness and friendship. It’s a place children, can feel comfortable to snuggle down or explore with confidence. Far removed from an institutionalized sterile setting, hygge offers children within your setting a sense of security and well-being. An extension of their home and not a watered-down version of school. Maria Montessori said “adults admire their environment; they can remember it and think about it – but a child absorbs it. The things he sees are not just remembered; they form part of his soul. He incarnates in himself all in the world about him that his eyes see and his ears hear”. As we are all aware in Early Years levels of well-being are fundamental to children’s development and progress. Thoughtful caring practitioners, ensure secure relationships are formed, building connections and helping children to settle into nursery life. Practitioners must not only work hard to develop these attachments, remembering the physical environment is fundamental to children’s well-being too. Well-being is a particular state or feeling that can be recognized by satisfaction, enjoyment & pleasure. The person is relaxed and expresses inner rest, feels the energy flow and radiates vitality, is open to the surroundings, accessible and flexible. Relaxed and inner peace children have a relaxed and open expression, not feeling wary or uncomfortable in any way. Vitality children’s body language is strong, their chest and head is high and not slouched. Their expressions are radiant and bright. Self-confidence children are confident in their own self and abilities. Why are we doing what we are doing? Many have questioned, who is it for? “Children are miracles. Believing that every child is a miracle can transform the way we design for children’s care. When we invite a miracle into our lives, we prepare ourselves and the environment around us. We may set out flowers or special offerings. We may cleanse ourselves, the space, or our thoughts of everything but the love inside us. We make it our job to create, with reverence and gratitude, a space that is worthy of a miracle! Action follows thought. We can choose to change. We can choose to design spaces for miracles, not minimums. 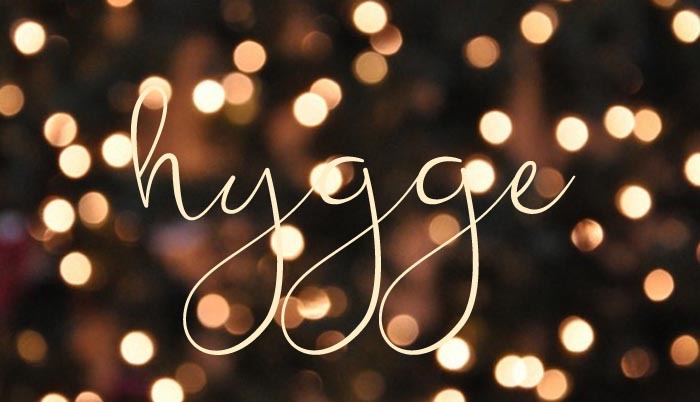 How can we bring Hygge to our provision? Within a Hygge setting, there will be a calm relaxed feel to the play space with areas for children to retreat and get comfortable or cosy. View the environment through the eyes of the child. Invite children to create dens or cosy corners, with the use of drapes, voiles and blankets. Set up thoughtful nooks and well-appointed retreats, position them away from the main traffic within your setting. 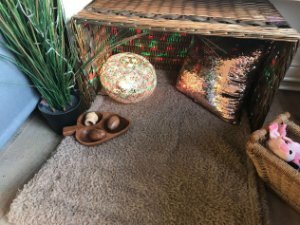 Provide children with a place to retreat away from the hustle and bustle of the main movement of the setting, allowing children privacy to talk, chat and interact. 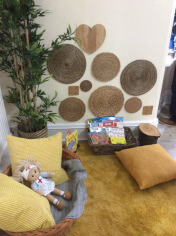 Provide plump cushions and blankets which enable children to get cosy when reading books or engaging in a provocation. Lighting is soft and muted. Reduction of noise levels, through soft furnishings. Provide opportunities to crawl inside a baby nest or enclosed area where they feel secure. Provide seating where children can curl up with a nice book. Hygge within your early years provision will help impact learning and ensure we value the children within! Cherish the little miracles we have the privilege of educating and create environments that show them how special and unique they really are. At The Curiosity Approach education is not drip fed through the tops of children’s heads, it comes from the heart and soul and only with true connections of heart and mind can we truly educate the whole child. Curious about what “Arbejdsglæde” means?